Cairns is a popular travel destination along Australia's coast. 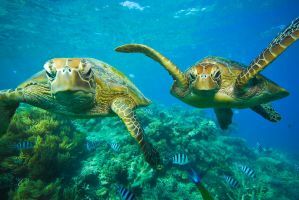 It serves as the gateway to the Great Barrier Reef and it is a popular place to visit for young travelers and backpackers. If you're traveling alone, there is no shortage of hostels that offer a social setting at a good price. Caravella Backpackers Hostel is conveniently located on the Esplanade near boats that head out to the Great Barrier Reef. It's also just a short walk from the lagoon and Reef Teach. It's a great place to stay with a swimming pool and a large kitchen. The rooms are clean and comfortable and the hostel is social without having an intense party atmosphere. The staff is wonderful and the hostel is a favorite among backpackers in Cairns. The hostel has a variety of amenities including free air conditioning, discounts on evening meals, and all kinds of travel information. There are several common areas in the hostel including a large pool and an outdoor area with tables. The hostel has an 11 pm curfew in these areas so it is possible to get a decent night's sleep. There are both dorms and private rooms available. The hostel is a favorite among independent travelers as well as families and small groups. Gilligan's Backpacker Hostel is a great place for solo travelers who want to experience some of Cairns famed party scene. This hostel hosts regular social events that encourage guests to have a good time and get to know each other. There are also cheap dinners served nightly and regular tours of the city. It's a popular hostel and you can always expect a crowd. There are both dorm rooms and private rooms available, all of which are air conditioned. Each floor of the hostel has a shared kitchen and a common area that is perfect for relaxing with a book, watching television, or just socializing. Other amenities available through the hostel include free bed linens, free airport transportation, wireless internet, and a lagoon swimming pool. There's also an onsite bar and many different televisions that are almost always playing current sporting events. The hostel also hosts regular events including themed parties and music nights. The hostel is conveniently located near Rusty's Market. It's also near a variety of shops, restaurants, and bars. 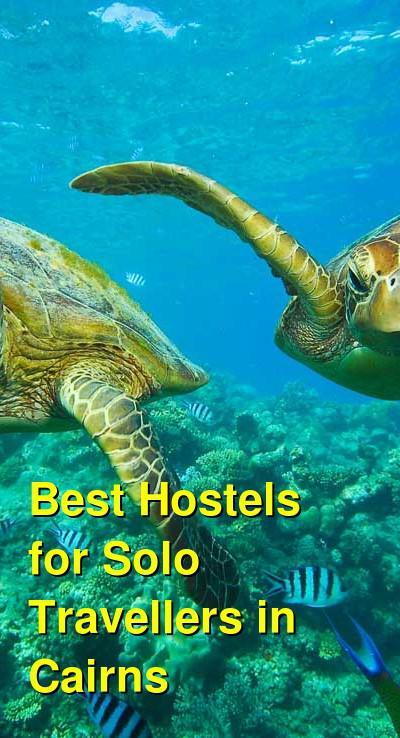 This hostel is another popular option for solo travelers. The hostel has several great places to hang out and meet other guests. There's a shady backyard where you can relax, or you could take a swim in the swimming pool. There is also a television area if you want to spend some time indoors. The hostel offers a variety of rooms including singles, doubles, twins, and four or six bed dorms. The dorms are all air conditioned, but there is an additional charge for air conditioning in the private rooms. This hostel offers guests a variety of amenities including coupons for restaurants in the area, free wireless internet, all kinds of travel information, and even a book exchange. There are also discounts available for the airport shuttle. If you're looking for a friendly and social hostel, then Cairns City Backpackers Hostel is a great option. It's perfect for solo and independent travelers who want to meet other guests. If you're a female that's traveling alone, and you want to stay in a comfortable yet fun location, then Cairns Girls Hostel is a unique option. The hostel is in the city center and it's located in a 1930s home that was built for the original founder of the city's first department store. It is a clean and quiet place to stay with plenty of amenities. It doesn't have the most social atmosphere, but it is a quiet and secure setting if you're hoping to escape some of the wild nightlife found around Cairns. The hostel is reasonably priced and offers a pick up service from several different transportation hubs. It's a locally owned hostel that is popular with women from around the world. It's just a short two minute walk from many of the city's top shopping areas and tourist spots. The hostel provides a variety of amenities including tour bookings, travel information, and free bed linens. The hostel is small, with just 38 beds, so it has a personal feel. Every room has it's own fan, bedside tables, and desks for guests. Luggage storage is available as well.